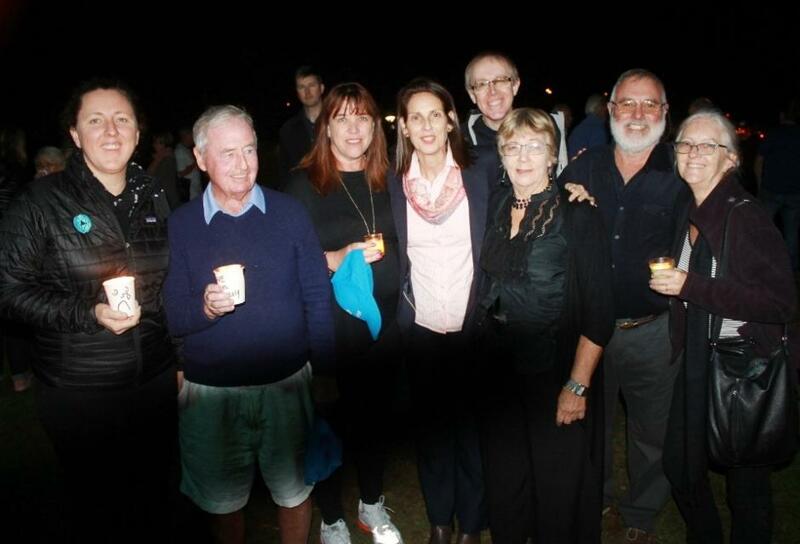 L to r: Pittwater Council Councillors Selena Griffith, Bob Grace, Julie Hegarty, Mosman Deputy Mayor and SOCC spokesperson, Carolyn Corrigan and Mosman Councillor Tom Sherlock, Lynne Czinner (Pittwater Councillor for 16 years, Deputy Mayor 1999-2002, Pittwater Mayor 2004/2005) General Manager at Pittwater Council for 9 years, Cr. Sue Young, Pittwater Council - in the Village Park, Mona Vale, May 13, 2016. After the state government's Proclamation announcing the immediate dissolving of Pittwater Council on Thursday and initial anger had abated, a ‘Wake for Pittwater’ was held on Friday May 13th, ‘Black Friday,’ at which the possibilities of how to retain or reinstate local democracy for those who live in Pittwater, and whether to continue to fight for Pittwater was discussed. A recounting of the growing 'comedy of errors', including remembering a chunk of a former Pittwater park once sold to developers by Warringah where now stands a block of units, or the most recent 'Inquiry' at Dee Why where one Warringah advocate was heard to complain of her soccer club losing its funding due to Pittwater's secession decades ago and the Pittwater rate funded support of all things out of Pittwater suddenly drying up as a 'submission', the resilient 'never say die' spirit Pittwater is most well known for meant there were more smiles than tears at the 'wake'. Councillors Hegarty, Young, Grace and Griffith thanked everyone in the community for all their support during the past years of proposed amalgamation processes stating that although they were disappointed with the announced outcomes they were even more disappointed with the processes used and all the anger this has caused in the community. The four Pittwater councillors, still without any formal notification of their dismissal, who found their email passwords had also been changed on Thursday the 12th without any notification of that occurring either, an experience unlike the messages and forwarding politely occurring in other areas, have decades of experience in local government between them and proven track records of listening to those they were voted in to represent and delivering what residents request of them. On Friday they asked the community to be understanding and supportive of Pittwater Council staff who would be also be uncertain about what's next at present and doing their utmost to get any work required of them done. They reiterated they would still like to hear from the community what they want to happen next, whether residents are happy to settle for a merged council or would prefer to persist in trying to keep Pittwater as is, or was. The options discussed were the possibility of pursuing legal action as a community should the outcome of Woollahra’s legal case prove their case, citing that although there are various legal challenges being pursued by other councils, the non-release of the KPMG report remains a key point in each. Cr. Grace expressed disappointment that the Council Meeting scheduled for Monday May 16th was stopped by this announcement as a second Motion to pursue legal action had been tabled. 1. That Council seek a second legal advice from Dr C Birch, SC, or Mr Peter King, Barrister, as a matter of urgency, as to whether Council has a case to initiate legal action against the Minister for Local Government in respect of the proposed mergers. Such advice to give an indication of the chances of success and grounds for such action. 2. If advice is that Council has a reasonable chance of success, then court documents be prepared as a matter of urgency to initiate proceedings. 3. That interim court proceedings be commenced as a matter of urgency to seek undertakings from the Minister that no action be taken against Pittwater Council before such legal proceedings are determined. 4. In the event that present proceedings by other councils are determined adversely for such councils then Council reconsider whether to continue its action or withdraw. 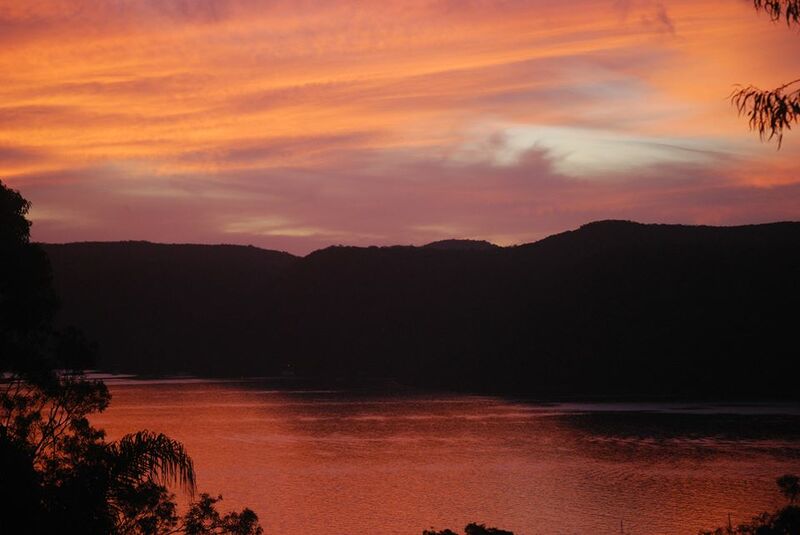 Another option raised was beginning the process of secession again, inviting the very recently excised from the original Pittwater suburbs of Ingleside, Elanora and North Narrabeen to ‘come on home’. Was answered with "Yes!" by those attending. The date of the first election of the councillors of a new council has been relegated to 9 September 2017 by the state government's Minister for Local Government. "A fantastical lapse of months compared to the '30 days' allocated to councils to on demand-answer what amalgamation 'options' they will forward in 50 words or less, or the six weeks allocated to inquiries of forgone conclusions,"
In the 15 month meantime, unelected administrators, appointed by the current state government, and those one minute described as 'outgoing' and in the next breath as the 'interim council', also 100% unelected, have a few Proclamation dates to meet. (1) The day by which a new council must have an operational plan is 1 August 2016. At the official opening of the West Head Army Track yesterday, Saturday May 14th, Pittwater MP Rob Stokes singled Jim Macken, whose book 'Pittwater's War' inspired an investigation into WWII Fortifications at West Head, Rohan Walter, known for his passion for giving something back to the community and heading up the West Head Awareness Team (WHAT), Peter Rae, the gentleman who, along with members of the 4HR group spent 12 months constructing two models, one a wonderful diorama, along with NPWS's Natasha Funke and her team of NPWS field staff who did all the initial clearing of weeds at the WWII fortifications at West Head. 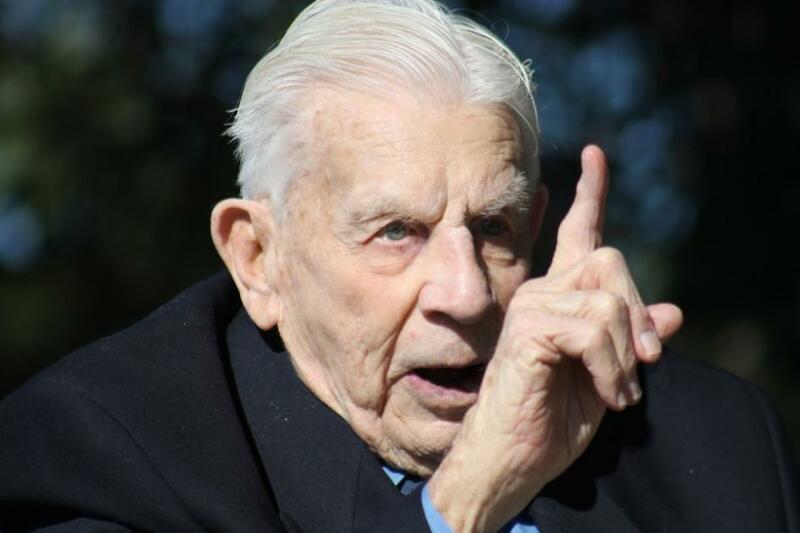 The Minister for Planning, who was Minister for the Environment when the project to renew the track began, dedicated the work in thanks for his service to a gentleman who had served at West Head, Jack Mercer, standing back and insisting 'Bluey' cut the ribbon to the restored track. Below the track Churhc Point Ferry Service's 'Elvina', the built at Palm Beach by the Goddard's as The Falcon, the little ferry that once moved the soldiers across Pittwater to West Head, sounded her horn as the track was opened. Mr. Mercer waited atop the track as those attending the opening happily descended to see the site and then began the arduous climb back up - 'it's 450 metres down but twice as long coming back!' he warned before the hike. He was more than a little bit right! Imagining when NPWS field staff had to take equipment to the base of this hill to begin the work of clearing the weeds covering the Observation Post and Gun Batteries, two of them, prior to the steps being installed, or all the research WHAT volunteers, backed up by 2012 RAA Association of NSW secretary and Pittwater RSL sub-branch Snr. Vice President - Michael Carrodus, the restoration of this historic site is a huge credit to all involved. Three races into the MC38 Autumn Series and Leslie Green’s reigning Australian champion Ginger leads Howard Spencer’s defending Season champion Menace, sailing for New Zealand. 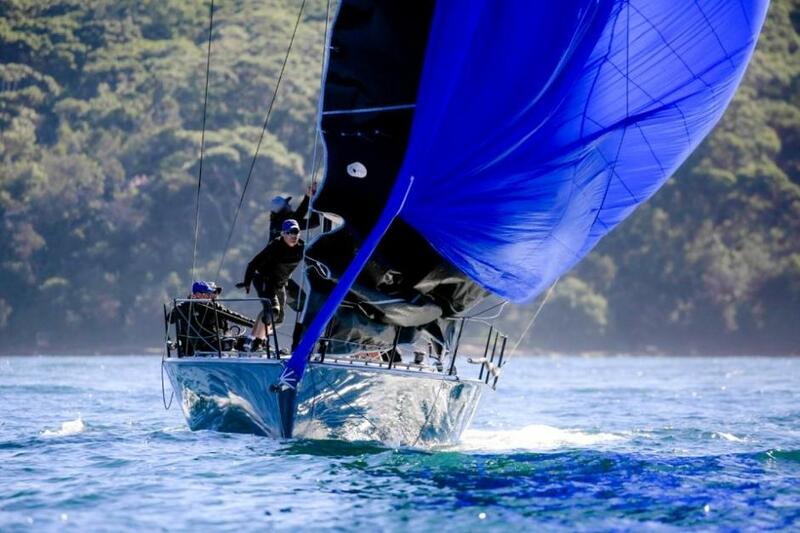 John Bacon’s Dark Star “killed it in the first race” then things went weird for the Royal Prince Alfred Yacht Club team. Tomorrow’s program, Sunday May 15, is due to start at 1100hrs with up to three races scheduled. A couple of other Sydney clubs had fleets out today and tomorrow the MC38 fleet will be threading their way through the huge CYCA Winter Series fleet. Member for Pittwater Rob Stokes has announced $25,000 to support the Royal Prince Alfred Yacht Club’s disabled sailing program. 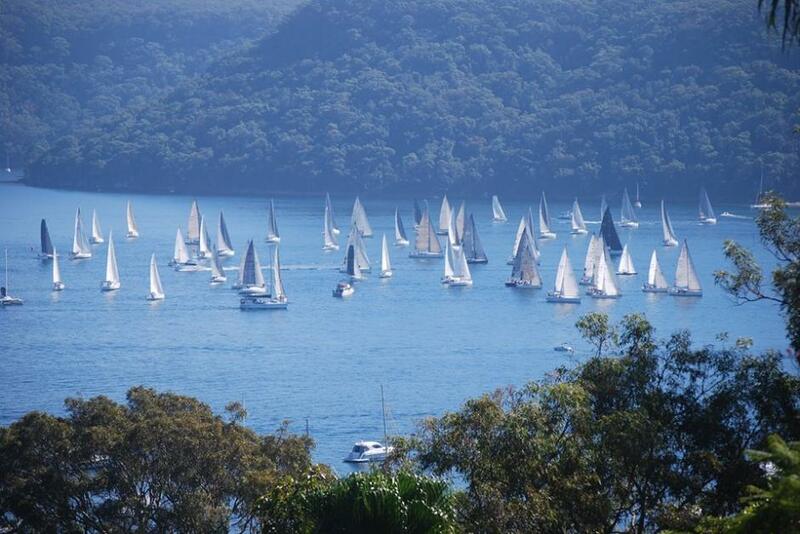 The funds have been provided under the NSW Government’s Local Sport Grant Program and come as Sailability NSW is celebrating its 20th anniversary in Pittwater. The Royal Prince Alfred Yacht Club is a long-term supporter of disabled sailing opportunities and is currently working towards the introduction of new pontoons and an accessible ramp. “This is a fantastic project that will help get more sailors out on the water,” Rob Stokes said today. “Along with Sailability the Royal Prince Alfred Yacht Club has done an outstanding job breaking down the barriers to sailing and ensuring people of all abilities can get involved. 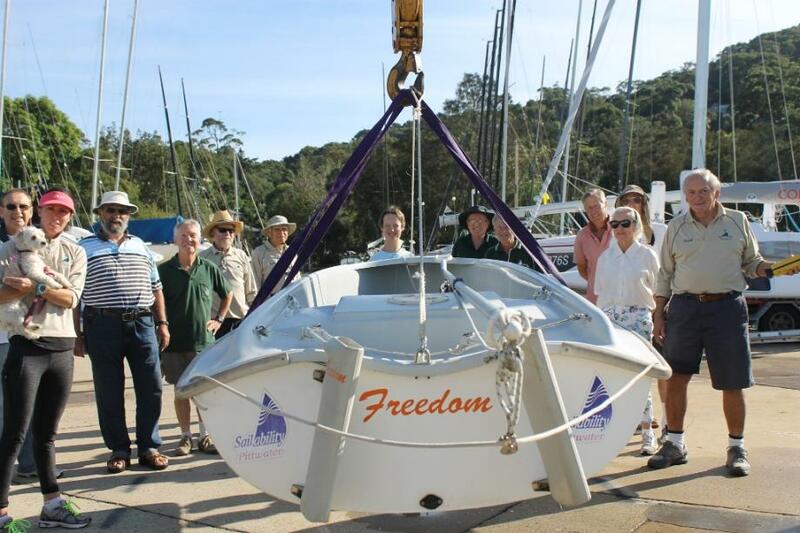 “There’s no better place to learn to sail than Pittwater – so it’s great that new opportunities are being created for those who require extra assistance. 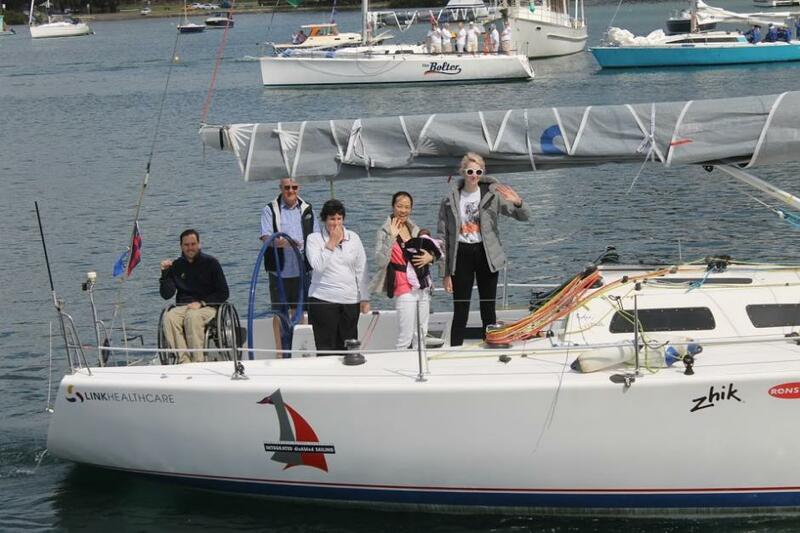 “Over the past twenty years we’ve seen huge improvements in disabled sailing opportunities throughout our community and it’s largely thanks to Sailability and its strong relationships with our local clubs and community groups. “This project will be a great addition to our community and I’m delighted the NSW Government is getting behind it,” Rob Stokes said.
" We were thrilled when Rob Stokes MP, Member for Pittwater advised the Club earlier in the week that the Grant application made to the NSW Government’s Local Sport Grant Program administered by the NSW Sport and Recreation had been successful and that $25,000 had been awarded to assist in building accessible pontoons at our Crystal Bay hardstand facility. " General Manager of the RPAYC Suzanne Davies said on Saturday. "Sailability has been sailing from this site for many, many years and we have developed plans to improve accessibility for our disabled sailors by installing floating ramps to provide access to the launching pontoons. We are delighted with the Grant which will contribute to the provision of these facilities and is also further recognition of our Integrated disAbled Sailing Program which was last week was acknowledged at the Clubs & Communities Awards taking out the category forDisability and Social Inclusion. The Award was presented by Mike Baird and accepted by Club Commodore Ian Audsley. I attended the evening as did Sailability Crystal Bay President Allan Jones, the Club Director and Chair of our Integrated Disabled Sailing Board of Governors along with Club member and Solider On volunteer Bruce Fergusson. This is the second award for this program in 12 months, joining the Marina Industry Association Award for Best Community Program which was presented in Queensland in May last year." 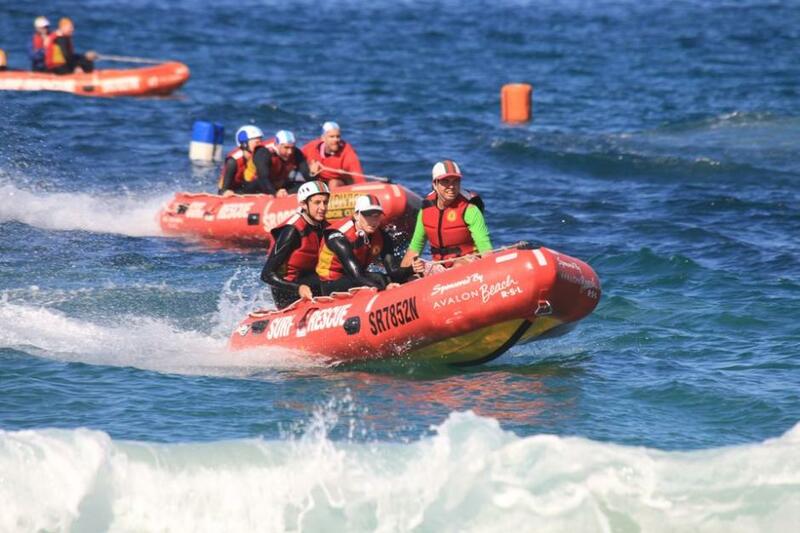 It's racing season again as the 2016 NSW Inflatable Rescue Boat (IRB) Premiership Series kicked off last weekend at Caves Beach in the Hunter. Defending Premiership champions, Kiama Downs SLSC and NSW champions, Caves Beach SLSC, will be the teams to beat again after their dominant performances in 2015. 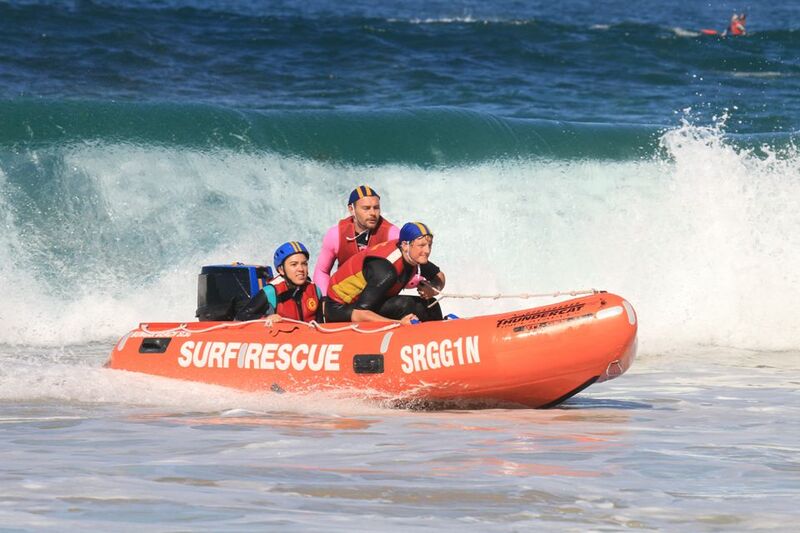 The sport showcases real life rescues and highlights the skill and speed used when protecting beachgoers and ultimately making them better surf lifesavers. 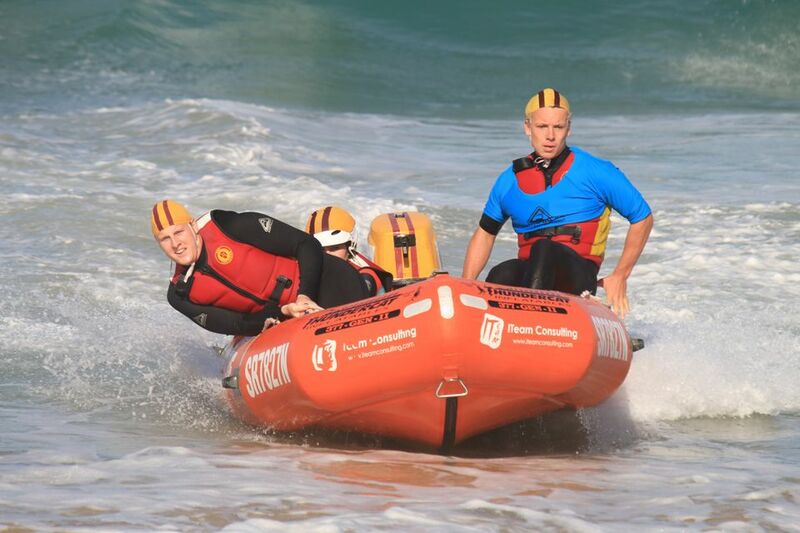 IRB racing very much appeals to the younger members of Surf Life Saving, however there are a number of experienced competitors who can match it with the rookies around the cans. The 2016 IRB Premiership Series promises to be another nail-biter with just three points separating the top two clubs after a superb weekend of competition at Caves Beach during Round One. The two day-event brought together more than 200 surf lifesavers and a host of supporters from around the state to watch the premier event of its type that highlights the skill and speed used by surf lifesavers when keeping beach goers safe in this famous piece of rescue equipment. Kiama Downs (South Coast) took Round One bragging rights by only three points in front of hosts Caves Beach with Sydney Northern Beaches Club Queenscliff claiming third spot in the standings. Newport SLSC in IRB Premiership 2016 - photo by Richard Black.